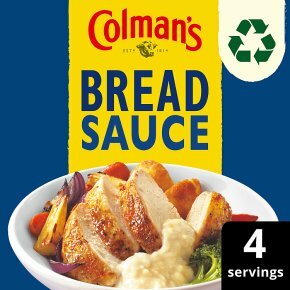 A bread sauce mix with a hint of nutmeg. Step 1:	Saucepan Empty the contents of the sachet into a saucepan. Step 2:	Measuring Jug Pour a little milk into the pan and mix. Stir in remaining milk and bring to the boil, stirring continuously. Step 3:	Saucepan Simmer for 2 minutes.